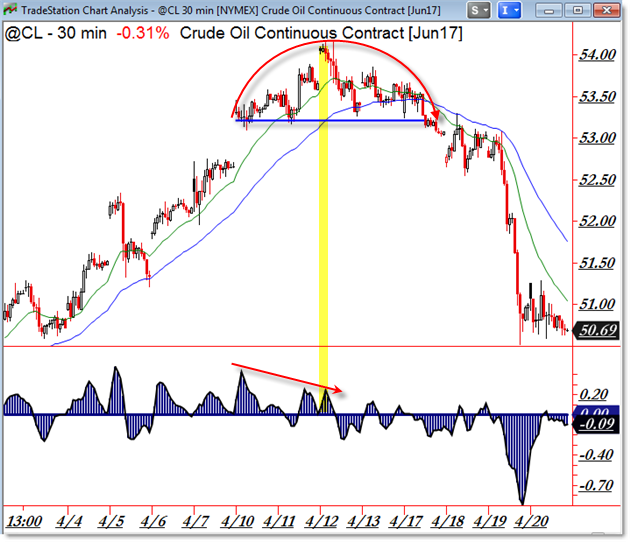 From Corey Rosenbloom: Crude Oil plunged toward the $50.00 per barrel level, collapsing from negative divergences into resistance. This was our forecast play for Oil – a bearish swing “down away from” the $54.00 level for members. I called for buyers to take profits into the $54.00 higher frame resistance and allowed for an aggressive short-sell strategy on the departure from resistance. It took a couple days of sideways action near $53.50 but the final breakdown (safe entry) triggered beneath $53.25 (blue trendline) and from there saw the collapse begin beneath $53.00. The initial push of selling culminated like an avalanche with yesterday’s breakdown and collapse toward $50.50. Remember our simple or initial planning target was $51.00. Focus on the price action into this pivot and – once again – get ready to trade the departure from $50.00. The United States Oil Fund LP ETF (NYSE:USO) rose $0.02 (+0.19%) in premarket trading Friday. Year-to-date, USO has declined -10.07%, versus a 5.28% rise in the benchmark S&P 500 index during the same period. USO currently has an ETF Daily News SMART Grade of B (Buy), and is ranked #28 of 126 ETFs in the Commodity ETFs category.